Hollywood actor's son Cameron, 39, has welcomed a daughter with his yoga instructor girlfriend, Viviane Thibes. Cameron announced the happy news on Instagram, sharing a photo from when Viviane was pregnant, and praising her by calling her a "beautiful Amazon warrior". Back in August, a spokesperson confirmed to People that Cameron was expecting his first child. They said that everyone is "thrilled" and "Michael is looking forward to being a grandfather". Cameron was previously sentenced to five years in prison for drug-related offences in 2010, but his term was extended further after he admitted to smuggling drugs into jail. He was placed in solitary confinement from 2012 until 2014, and was released to a halfway house in August 2016. The actor and his girlfriend were first pictured together in 2016. It has been reported that Cameron will write a tell-all book about his experiences. 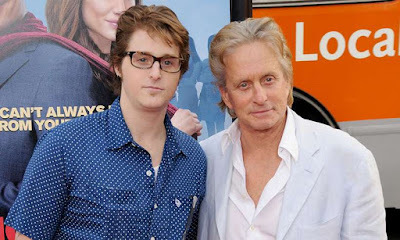 A source told Page Six: "Cameron will talk about his struggle being the son and the grandson of Hollywood icons, and then his bad decisions which led him to jail, and then solitary confinement. He is staying low-key after his release and plans to spend time with his mother and father. He believes this is a new start, and a chance at a new life." Cameron is 73-year-old Michael's only child with his first wife Diandra Luker; the former couple were married from 1977 until 1995. He has two half-siblings – Dylan Michael, 17, and Carys Zeta, 14, from Michael's marriage to Catherine Zeta-Jones.